§ 61.21 Duration of a Category II and a Category III pilot authorization (for other than part 121 and part 135 use). (a) A Category II pilot authorization or a Category III pilot authorization expires at the end of the sixth calendar month after the month in which it was issued or renewed. 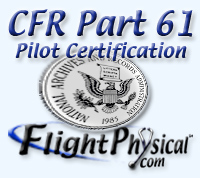 (b) Upon passing a practical test for a Category II or Category III pilot authorization, the authorization may be renewed for each type of aircraft for which the authorization is held. (c) A Category II or Category III pilot authorization for a specific type aircraft for which an authorization is held will not be renewed beyond 12 calendar months from the month the practical test was accomplished in that type aircraft. (d) If the holder of a Category II or Category III pilot authorization passes the practical test for a renewal in the month before the authorization expires, the holder is considered to have passed it during the month the authorization expired.